I have no objection to reenacting “casualties” in theory. In practice, it’s another matter. I can’t tell you how many living history events I’ve been to where the dead and wounded have drawn chuckles because the participants were either having a little too much fun or were terrible actors. All it takes is one corny “fatality” to turn an ostensibly educational enterprise into a travesty. One of the best reenactments I ever saw had no casualties at all. It was at a national park. Since the NPS doesn’t allow casualty reenactments, the soldiers did everything but take hits. They advanced, retreated, yelled, and took cover, but nobody feigned an injury or death, while a ranger narrated the action. It was both enlightening and entertaining, and the crowd seemed to enjoy it. You might argue that a reenactment without casualties would give the public an artificially sanitized view of battle, one that trivializes the reality of warfare. Personally, I don’t think it’s nearly as trivializing as the spectacle of some guy who couldn’t carry a background role in an Ed Wood movie rolling around on the grass, clutching his abdomen, and yelling that he’s a goner. During my last stint in grad school I helped out with a conversational English program at a Knoxville church. The students came from a variety of places, but East Asia was probably the most common point of origin. During one class–I don’t remember how this happened–the topic of reenacting came up, and most of the students had no idea what we were talking about. As I tried to explain what reenactors do, one guy from China was absolutely bumfuzzled by the whole concept. “They shoot guns?” he asked. He thought about all this for two or three seconds…and then he started laughing hysterically. The notion that adults would put on historical clothing and pretend to shoot at each other for fun was absurd to him. Most of the other students were just as perplexed. They were looking at me like I’d just told them that some Americans liked to put on Mickey Mouse ears and fling salad dressing at each other. Ever since that conversation, I’ve sort of assumed that reenacting was an essentially Western and white phenomenon, basically limited to the U.S. and Europe. But a few days ago I ran across something in an unexpected source. I’ve been reading a biography of Barnum Brown, one of the twentieth century’s most famous fossil hunters and a longtime collector for the American Museum of Natural History in New York. (He’s the guy who found the type specimen of T. rex.) Brown was a product of the frontier, born in Kansas in 1873. In 1889, he set out with his dad on a wagon trip across the West to find a new home for the family. 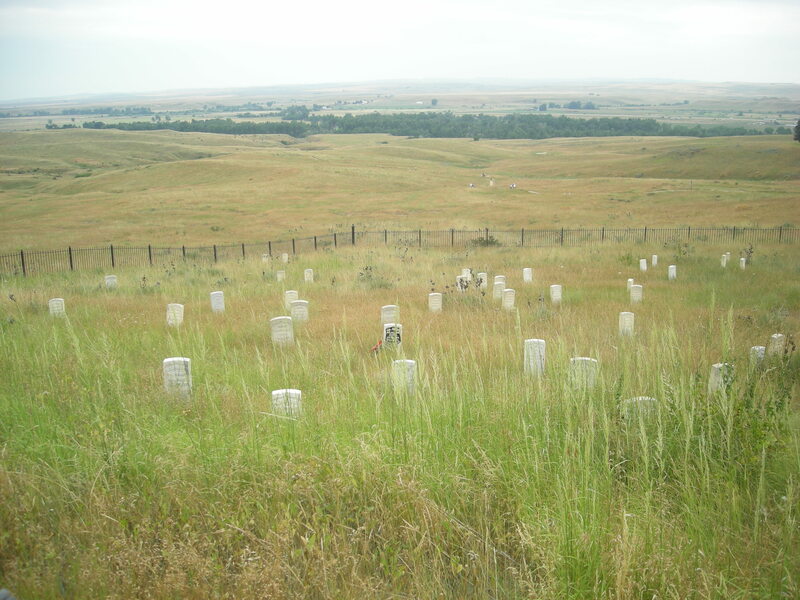 On July 4 they arrived at the Little Bighorn in time to see the Crow Indians engaged in what Brown’s biographers term a “reenactment” of Custer’s defeat. Although this tribe had always been friendly to the whites, the Commandant was taking no chance, so he had two companies of the garrison under arms, and two Gatling guns trained on the battleground. I well remember the occasion: squaws with papooses on their backs or in their laps sat all around the edge of the battlefield…. That’s pretty much all the book has to say about this event, but it’s a fascinating passage. I’d never heard of any Native American tribe recreating a battle. I poked around a little and found a similar reference in another book. In her examination of memory and Little Bighorn, Debra Buchholtz says the Crow “were the first to reenact the fight in the immediate battlefield vicinity” on July 4, 1891 with Indians playing Custer’s men as well as the Native Americans. That would have been two years to the day after Brown claimed he saw an Independence Day reenactment; maybe Brown had his dates wrong, or maybe this was some kind of annual event. The Crow weren’t the only people reenacting the battle around that time. Buffalo Bill Cody was staging portrayals of Little Bighorn for his traveling show. Buchholtz also refers to a 1902 reenactment in Wyoming between Indians and a National Guard unit and another with both whites and Native Americans at the Crow Fair in 1909. But it’s the notion of the all-Indian reenactments at the battleground, held only a little more than a decade after the real thing, that fascinates me. What was the impetus behind it, and how did the participants’ motives for staging it compare to the motivations of modern-day reenactors? What role did this reenactment play in Native American culture, and how different would it be from the role of reenacting in modern American culture? If you were planning to watch some reenactors do their thing at Minute Man National Historical Park this year, you’re out of luck. But it turns out the organizers of the Delaware crossing reenactment pick their Washington through a formal audition process every few years. Think American Idol, except with middle-aged men in tricorn hats. It’s the subject of a short documentary produced by The Star-Ledger. I recommend watching the film, not just because it’s a fascinating glimpse into the commemoration of the Revolution but also because it’s surprising to see how fierce the competition is and how passionately these guys want the role. There are Rev War reenactors for whom this is the holy grail of living history, but of course only one guy is chosen, and there are some bitter feelings when the winner is announced. Of the competitors featured in the documentary, I think the guy who bore the strongest resemblance to Washington was the winner, but the film doesn’t really show any of them in character except for a few brief speech excerpts. Portraying Washington at an event seems like it would be pretty tough, at least if you were really trying to get it right. Doing first-person interpretation to a crowd requires you to be engaging, but Washington was famously reserved. He was also a rather bland public speaker, at least when using a prepared text. I’d imagine that playing somebody more personable, like Franklin or Lincoln, would be a lot more fun. …when a spectator actually passes out.